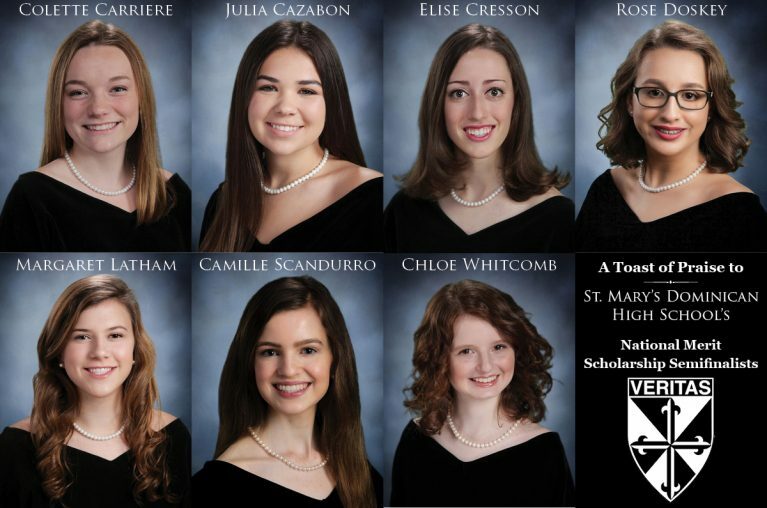 National Merit® Scholarship Corporation (NMSC) has recognized seven St. Mary’s Dominican High School students as Semifinalists. They are: Colette Carriere, Julia Cazabon, Elise Cresson, Rose Doskey, Margaret Latham, Camille Scandurro, and Chloe Whitcomb. As Semifinalists, they are among approximately 16,000 Semifinalists in the 64th annual National Merit® Scholarship Program. These academically talented high school seniors have an opportunity to continue in the competition for some 7,500 National Merit Scholarships worth more than $32 million that will be offered next spring. To be considered for a Merit Scholarship® award, Semifinalists must fulfill several requirements to advance to the Finalist level of the competition. About 90 percent of the Semifinalists are expected to attain Finalist standing, and about half of the Finalists will win a National Merit Scholarship, earning the Merit Scholar™® title. NMSC, a not-for-profit organization that operates without government assistance, was established in 1955 specifically to conduct the annual National Merit Scholarship Program. Scholarships are underwritten by NMSC with its own funds and by approximately 430 business organizations and higher education institutions that share NSMC’s goals of honoring the nation’s scholastic champions and encouraging the pursuit of academic excellence.